Review: Here we are in the first week of March and I think I’ve found the first truly delightful film of the year. We’ve just emerged from a season of heavy dramas and a start of the year that featured a seemingly endless supply of disappointments and cheap cash grabs. 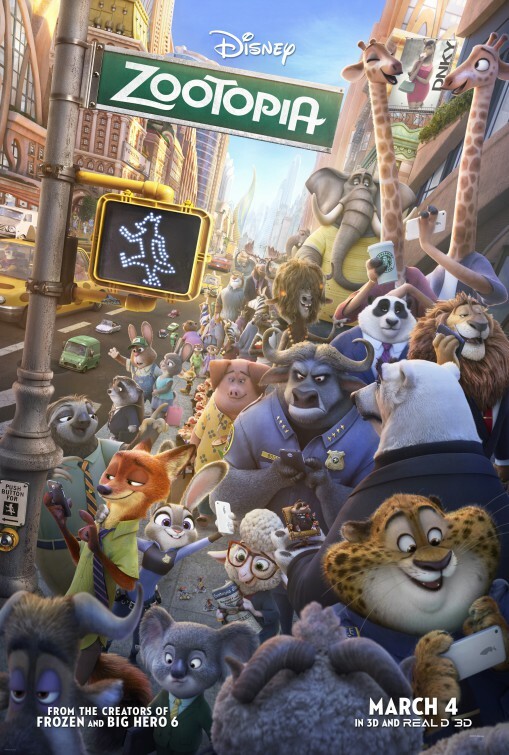 So to find a film as breezy and bright as Zootopia is most welcome, it’s a place you’ll want to visit more than once. Young Judy Hopps (Ginnifer Goodwin) is an idealistic young bunny rabbit that stands up to bullies and dreams of moving from her country life to Zootopia, an animal metropolis where predator and prey live in perfect harmony. With her sights set on becoming the first rabbit police officer, she overcomes the adversity of being 10 times smaller than her fellow police academy trainees and lands a job in the heart of the city. Relegated to the safety of being a meter maid, Hopps longs for more than just issuing parking tickets, though, and in short order gets involved with a plot to disrupt the peace between species. It’s a surprisingly complex plot that’s dreamed up here, giving Disney Animation the opportunity to explore a world of anthropomorphic animals with no human presence. It’s also the longest fully animated film produced by Disney since Fantasia in 1940 and carries an earned PG rating for some scary moments. The length and rating may give parents cause for pause but I’d encourage families to get out and see this one because not only does it have a typically Disneyfied message of being true to oneself and kind to others it’s wonderfully animated and, at times, hysterically funny. I like to laugh but don’t find myself often truly breaking down in movies so I have to admit that Zootopia hit my funny bone on several occasions. From a delightfully droll spoof of The Godfather to hilarious trip to the sloth-run DMV there are also references to Breaking Bad and a visit to an animal spa that really left me rolling. That the humor feels so genuine is a tribute to the script from eight screenwriters (the film went through some tweaking/reworking several times during production) . It’s such a sunny romp that when there are dark turns, they land with the right amount of nuance instead of stinking of a laboriously false tonal shift. Zootopia is divided into several different sections meant to recreate the inhabitant’s native habitat. The city center is your typical city setting while there are occasional detours to a rainforest, desert, and frozen tundra. Each world is designed to look and feel different and Disney animators have gone all out with fine details that keep each section separate yet still related to the others. The voice talent used here is also one of the most enjoyable casts that Disney has put together in quite some time. Goodwin is a bundle of joyous energy as Judy, as is Jason Bateman (Bad Words) as a sly fox who teams up with Judy in her investigation. Idris Elba (Prometheus) is commanding as Judy’s superior officer and J.K. Simmons (Terminator Genisys) pairs nicely with Jenny Slate (The Lorax) as Zootopia’s lion leader and his lamb second in command. And any chance to hear Bonnie Hunt (Monsters University) onscreen is welcome in my book. Zootopia is being released in IMAX and 3D and while I normally go for the biggest and best presentation I can find, this is one that won’t suffer from a traditional viewing and in fact may be preferred as the 3D doesn’t have the same impact as other films of its kind.